Sturdy and stable, the new design lets you exercise virtually every major muscle group in your body. 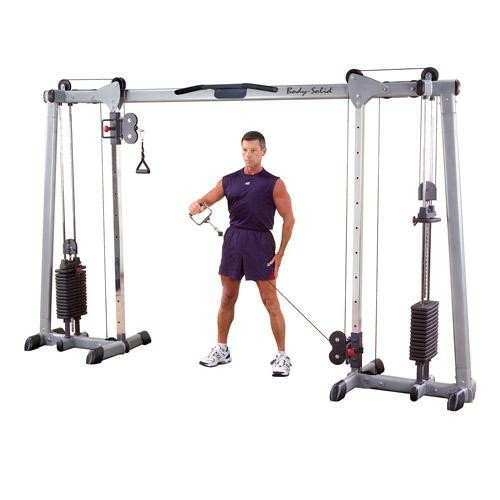 Interchangeable cable handles provide an unlimited number of possibilities for all experience lev- els, and the extra wide and tall mainframe provides you with easy access to an endless array of high and low pulley exercises. The Selectorized Deluxe Cable Crossover’s unique pull-up station offers multiple grip positions, and dual independent carriages have been ergonomically designed to offer twice as many height adjustments as previous Body-Solid crossover stations. With 20 independent height adjustments and 180° cable positioning for frictionless guidance in all directions, the Body-Solid GPCC250 is one of the most versatile and functional machines manufactured today.